Throughout history humanity has committed extreme crimes against itself, often in the name of God, because of racism and sometimes just because of a quest for land. The genocides committed by Genghis Khan in Mongolia, Pol Pot in Cambodia, Kim Il Sung in North Korea, Adolf Hitler in Europe, Talaat Pasha in Armenia and General Suharto of Indonesia come to mind as men who were the mastermind of the mass slaughter of millions during their times of power. None of these killers can compare, however, to the terrible crimes committed by the invading Europeans against the millions of natives of both North and South American tribes from about the time Columbus reached the Caribbean Islands until the end of the American-Indian wars in the Nineteenth Century. The stories have been carefully slanted in American history books to carefully cover the stain of the evils that were committed. But the surviving tribes have not forgotten. They still tell the stories of the death marches, of the “gift” of smallpox tainted blankets that wiped out entire tribes in a single stroke, of the seizing of their children by the Bureau of Indian Affairs in an effort to “Americanize” them and of the mass slaughter of entire tribes by invading soldiers. We made historic heroes out of military generals that led troops into open warfare against a people ill equipped to fight back against trained armies. Columbus and his men slaughtered and enslaved the friendly natives he found in the Caribbean. Cortez did the same thing in Mexico. Pizarro murdered natives in Peru. If they weren’t enslaved, raped and worked to death, the native people were starved or just plain slaughtered. 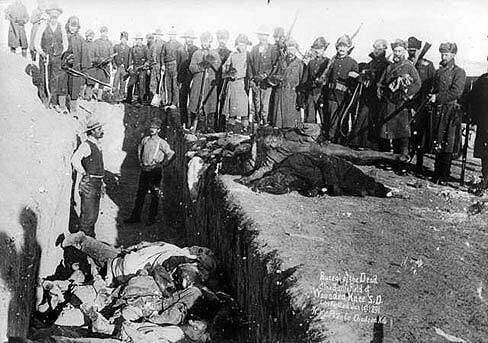 The numbers of the natives that were caught up in this mass genocide remain unknown because nobody bothered to take count. But contemporary research, with the help of DNA studies of the skeletal and mummified remains of South American people who lived over 8,000 years ago, is revealing the tribal lineage of entire civilizations that once thrived and then were completely eliminated from the face of the earth. Geneticist Bastien Llamas, author of the study recently published in Science, said entire populations were wiped out after the Europeans arrived. Of 84 genetic lineages studied from the South American remains, not one of them survived this contact with the Europeans, Llamas wrote. The Llamas article explained how the research team traced DNA by sequencing the genome of 92 skeletons and mummies from Mexico to Chile, following the genetic line from mother to child and extending back to their roots which some believe were in Siberia. The theory is that the original people worked their way into North America via a land bridge that once existed between Siberia and Alaska, then worked southward and eventually settled both American continents. After thousands of years of separation they evolved into unique tribal groups. The Europeans considered these people “savage” and no more than wild animals because their life styles, languages and spiritual belief systems were uniquely different. The natives did not share in the concept of land ownership although they were “territorial” in the places they lived and hunted. The settlers wanted the land and they proceeded to steal the native’s territory. It was not long before this conflict turned to a form of warfare. From the historical records, the settlers established a deliberate policy of “removing” the problem by taking their land and killing off the people living on it. It remains a dark and blood-soaked blot in American history.